Pelancho is the nickname that some of my aunts, uncles and cousins on my Mother's side (the Bouvets, Herrera's and Rosales) called me when we were kids. Some of them still do. It seemed appropriate to use it as my blog handle. The image of the star on Mount Franklin is important to me as my last job in my hometown of El Paso before I left on January 15, 1977 was to turn on and guard the star at night. The star graces the side of Mount Franklin in El Paso and is situated right above our family home. I worked at El Paso Electric company at the time. I would drive up to the mountain in a jeep and spend the night on the crest. It was a wonderful place to "PONDER" life, art, the future. On a few occasions I had to chase kids down off the mountain that had hiked up to shoot out the light bulbs. At the time the star was made of bulbs suspended from telephone poles. I'm not sure that is still the case. Also, the star was only lit during the Christmas Holiday. Today it is lit nightly and can be seen from over 100 miles away. The Mountains in El Paso while being landmarks in and of themselves house other landmarks of great consequence to me. In my youth the letters of all the high schools were painted on the mountain and on Friday nights they would be lit with luminarios during football season. Austin, my high school owns the piece of property that our A is placed on so while the others have faded, ours is still there for all to see. Not having been in El Paso during Friday night football for many, many years I am not certain whether the A is still lit during the games. Seen here from the Austin High Campus almost two miles away. Another landmark which I cherish is Cristo Rey. In Sunland Park, New Mexico west of El Paso, stands a 29 ft. limestone image of Christ carved by Italian sculptor Urbici Soler. Work on the sculpture began in 1937 and the stones were cut and prepared at quarries in the Austin area. The piece was completed in October of 1939 in time for pilgrimage. Soler's sculpture hosts thousands of pilgrims each year. The entire structure is 42.5 ft. high. Pelancho - Derived from the Spanish Esperanza (nickname for hope, expectation). It is taken from the title of Nuestra Señora de la Esperanza meaning "Our Lady of Hope." Profile Pic - "My Ancestors are only those people that I have already been!" 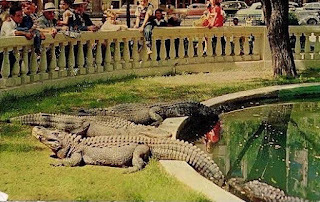 Another one of the my great recollections and landmarks in El Paso were the Alligators in San Jacinto Plaza. I went downtown often when I was a kid, sometimes with my parents and sometimes on the Government Hill bus by myself. They taught me to ride it when I was quite young, catching it on Rosewood and Montana Streets and getting on and off at the Plaza. We probably all did the alligators in by making a wish and throwing pennies into their pond. There has been many controversies regarding the removal of the alligators and the desire to bring them back. They have actually been venerated in the form of a public art piece by celebrated El Paso artist, the late Luis Jimenez. Welcome to Pelancho's Ponderings, a place to contemplate the arts, politics, amusing encounters and delightful ditties (not necessarily songs). Pelancho - Derived from the Spanish Esperanza (nickname for hope, expectation). It is taken from the title of Nuestra Señora de la Esperanza meaning "Our Lady of Hope." The Profile Pic is entitled "My Ancestors Are Only Those People Who I've Already Been". 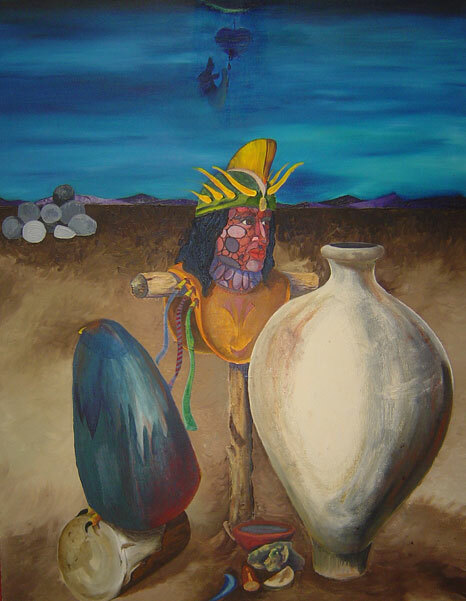 I painted it in homage to the writings of my childhood friend Albert Castillo.